Christening invitations balloon theme for a boy coming with square checked baby blue-white envelopes with a balloon pattern. Your personalized wording is printed on a baby blue card with a checked pattern in its finish and your bespoke invite is in red and blue color. 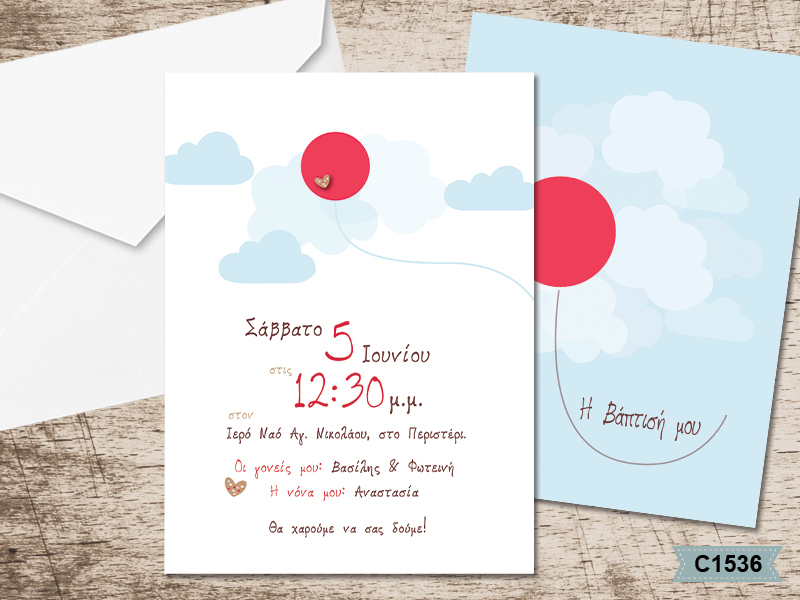 https://www.preciousandpretty.com/2017/10/balloon-themed-greek-christening-invitations-C1536.html Greek Wedding Favors|Orthodox Crowns|Stefana|Baptism Invitations Balloon themed Greek Christening invitations C1536 Ballon themed Greek Christening invitations for boys and girls Product #: Greek Wedding Favors|Orthodox Crowns|Stefana|Baptism Invitations_5811854216358612412 5 stars out of 5 reviews.